Last week I stayed at Le Parker Meridien in New York. I booked my room not knowing anything about the place except that it was in the perfect location for my nearby meeting. The hotel is nice enough and on check-in I learned that they’re part of the Starwood Group. The view from the pool is amazing. They offer a fast and reliable internet connection. No complaints about the room or the service. But the soap….yuck! It had this awful burnt plastic scent. I woke up early for my meeting, took a shower, and for the rest of the day I worried that people were thinking to themselves “Wow, AAdvantage Geek smells like burning plastic”! 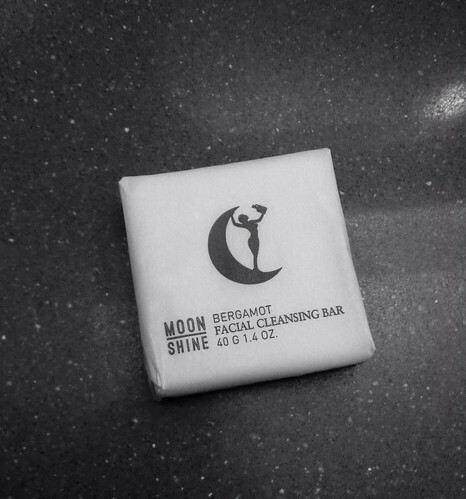 I’ve never heard of this brand of soap, Moon Shine Bergamot (not to be confused with the Moonshine Soap Company in Milwaukee who has a completely different logo). I Googled “Moon Shine Bergamot” and couldn’t find anything about it. I don’t usually pay much attention to the toiletries and I don’t really have a favorite hotel soap (though I must confess that I do like Kiehl’s), but it’s hard to ignore the hotel soap when it leaves you smelling like a burning tire. Anyway, I brought back a bar of this stuff to get a second opinion. Share your favorite and/or least favorite hotel soap in the comments section before midnight Pacific and I’ll have a random drawing in the morning. If I pick your name I’ll send you the soap and you can decide if it smells like burning plastic. Renaissance hotel Aveda soap. Simple clean scent. Less burning plastic after scent. Don’t stay at the le merdien NY, i got bed bugs last time i stayed there. Bulgari Red at MGM skyLOFTS.. smells soooo good!